Method 1: Use a denser sett to make your painted warp shine. One way to preserve the beauty of your painted warp is to make the fabric warp-dominant on both sides. Using a denser sett than usual will crowd the warp threads together, making the weft less visible. 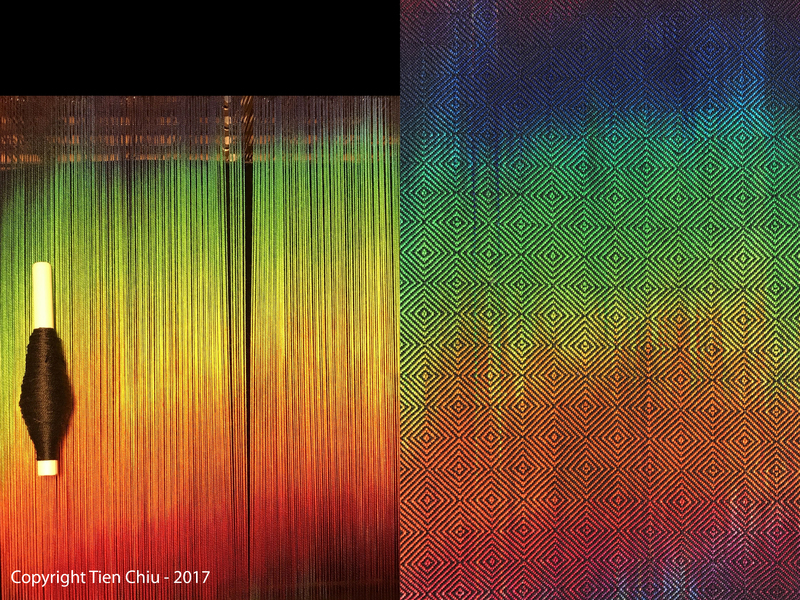 Here is a painted-warp sample in 10/2 cotton, using the medium gray weft pictured at the left of the image. Both warp and weft are 10/2 cotton. Painted warp sample using a denser sett than for a balanced weave. Warp is 10/2 cotton, weft is 10/2 cotton. Plain weave structure, sett at 30 epi/12 epc. Because using a denser sett results in fewer weft threads per inch than warp ends per inch (in a balanced weave they would be equal), this method works best when weaving simple structures such as plain weave. More complex structures will appear to be stretched lengthwise. For example, twill angles will become steeper (more than 45 degrees), twill blocks that would be square in a balanced weave will become tall rectangles, and so on. The degree of distortion depends on how much denser the warp is sett than it would be for a balanced weave. Method 2: Use a finer weft to showcase the painted warp. This is a painted warp in 10/2 cotton yarn, with a 20/2 cotton weft. The warp is roughly twice as thick as the weft. The sett is 30 epi (12 ends/cm), and the structure is plain weave. Painted warp sample showing how to preserve painted warp colors using a finer weft. Warp is 10/2 cotton yarn, weft is 20/2 cotton. Plain weave structure, sett at 30 epi/12 epc. Compared to the previous method, the finished cloth looks similar from a distance. However, viewed close up, the finer weft blends in more, while the thicker weft is more visible. The thinner weft also produces a thinner cloth with softer drape. Both methods work well; choose whichever method works best for your finished fabric. Close-up of painted warp sample showing how to preserve painted warp colors using a denser sett. 10/2 cotton warp and weft, sett at 30 epi/12 epc. Close-up of painted warp sample showing how to preserve painted warp colors using a finer weft. 10/2 cotton warp, 20/2 cotton weft, sett at 30 epi/12 epc. Using a finer weft can stretch or compress a woven pattern depending on sett density and weft size. In addition, since this is a warp-emphasis fabric, more warp than weft will show in the finished fabric. So simple structures such as plain weave will work nicely, but if your pattern needs to weave square, or you want bold patterning, try other approaches first. If only one side of your fabric will be visible, you can showcase the colors of your painted warp by choosing a weave structure that shows more warp on one side. For example, 3/1 twill will produce a warp-dominant fabric on the top of the fabric, since 75% of the warp is on top. Of course, the reverse side will be weft-dominant, so less of the painted warp will show. But the results can still be quite attractive, though the mood will be different. 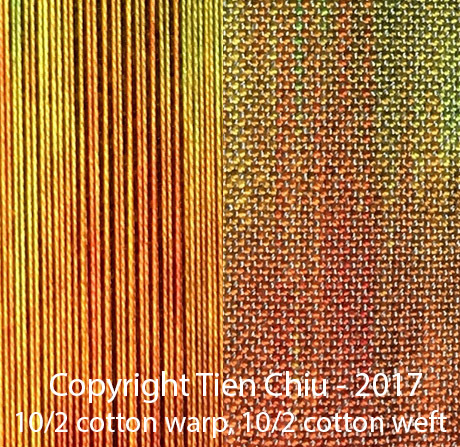 Handwoven sample showing how to retain the colors in your painted warp by using a warp dominant weave structure such as 3/1 twill. 10/2 cotton warp and weft, sett 30 epi (12 epc). 3/1 twill structure. Both sides of the fabric are attractive, but one has a bright, cheery feel, the other more foggy and muted. Woven into a scarf, you could wear it with very different clothing styles, simply by choosing which side to make visible. Method 4: Create blocks of color to make sure the your painted warp colors show clearly. 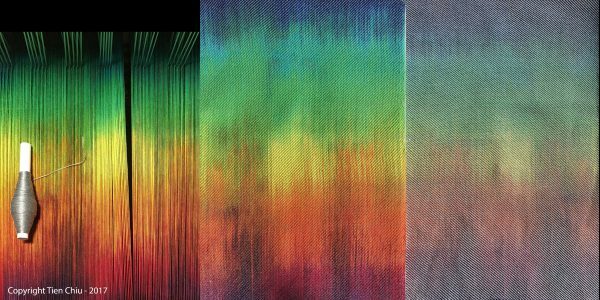 If you want to create fabric with clear patterning, but an equal amount of warp on both sides, the best way to showcase your painted warp colors is to design a fabric that alternates warp-dominant areas with weft-dominant areas. 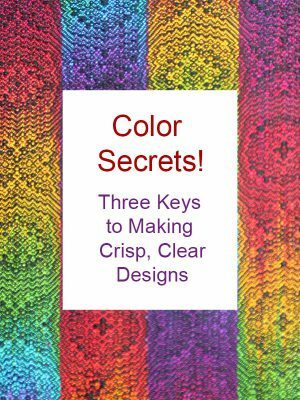 The bigger the chunks of color, the more brightly your warp will shine. Here are two samples. The first is woven in a 2/2 birdseye twill, which blends warp and weft fairly evenly; the second is 1/3 vs. 3/1 twill blocks, which blends them in larger patches. The warp is 10/2 cotton, the weft is black 10/2 cotton. Sample demonstrating how to use blocks of color to show off the colors in your painted warp. 10/2 cotton warp and weft, 3/1 vs. 1/3 twill blocks. Both fabrics are beautiful, and you might choose either depending on your intent for the cloth, but the colors are more vivid in the sample with larger chunks of color. Both fabrics are reversible. 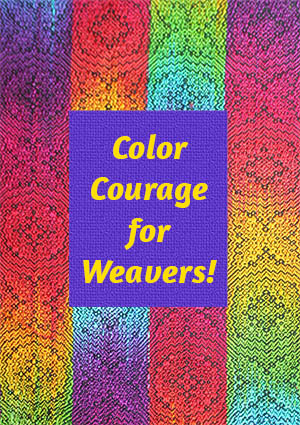 You may have noticed that all the weft colors used in this blog post are neutral colors: Black, white, and grays. Because these colors are neutral, they tend not to change the hue (color family) of other colors much. So if you want to showcase the original colors of the painted warp, neutral colors are generally a safe choice. More opinionated colors, such as blue or orange or purple, can produce spectacular fabrics, but they can also change or dull the colors in your painted warp. So while you can absolutely use bright-colored wefts successfully with painted warps (and you should definitely try using them! ), it’s a good idea to test the color combinations first, either by simulating the color mixes in weaving software or by weaving physical samples. Black is often recommended for painted warps because – being the darkest color – it makes other colors look brighter and lighter by comparison. The eye pays more attention to light and bright colors than it does to dark, dull ones. So – woven into a painted warp – black will recede into the background, allowing your your painted warp to show clearly. 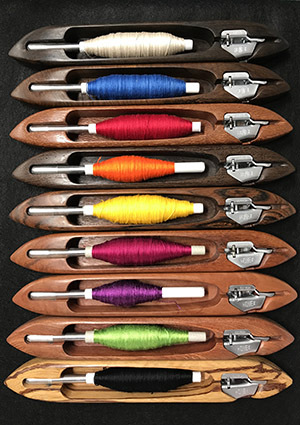 A white warp will do the opposite – because it is lighter than all other colors, it will “come forward,” with the potential for dominating your warp. Here are two samples, one woven with white and another with black weft. Both warp and weft are 10/2 cotton, at a sett of 30 epi. The structure is 3/1 vs. 1/3 twill blocks. In the sample with white weft, the white areas dominate, and the warp appears hidden behind the patches of white. But in the black-weft sample, the black areas recede, while the intensely colored warp pops forward. Gray can be an interesting choice – and is explored far less often than it should be – because it will likely be lighter than some of your colors and darker than others. When you weave using blocks of gray, the lighter colors “come forward” and the darker colors recede, giving the illusion of motion. Sample demonstrating the effect of gray weft on the colors in your painted warp. 10/2 cotton warp and weft, 3/1 vs. 1/3 twill blocks. In the darker areas, the gray dominates. In the medium colors, such as the green, the gray blends in. In the lighter areas, the yellow comes forward. This produces a “hide and seek” effect with the warp colors. In more evenly blended weave structures, black will darken the colors and white will bleach them. (See my blog article “How to use black to give handwoven fabrics pizzazz” for an explanation of how and why this works.) Grays, on the other hand, will soften the colors without lightening or darkening them as much as black or white. This can result in a pleasing watercolor effect. 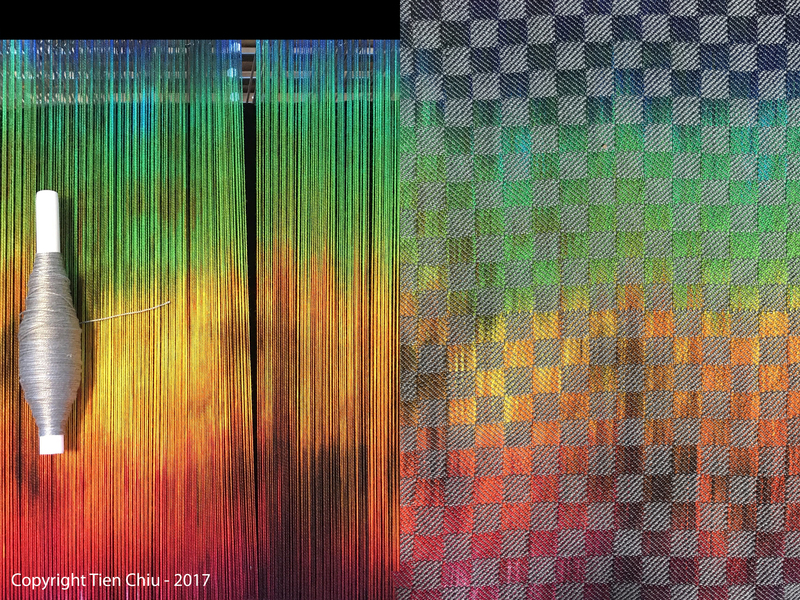 To illustrate the different impacts of gray and black, here are two samples, each woven in 3/1 twill, one using black and the other a medium gray weft. Both warp and weft are 10/2 cotton, sett at 30 epi (12 epc). 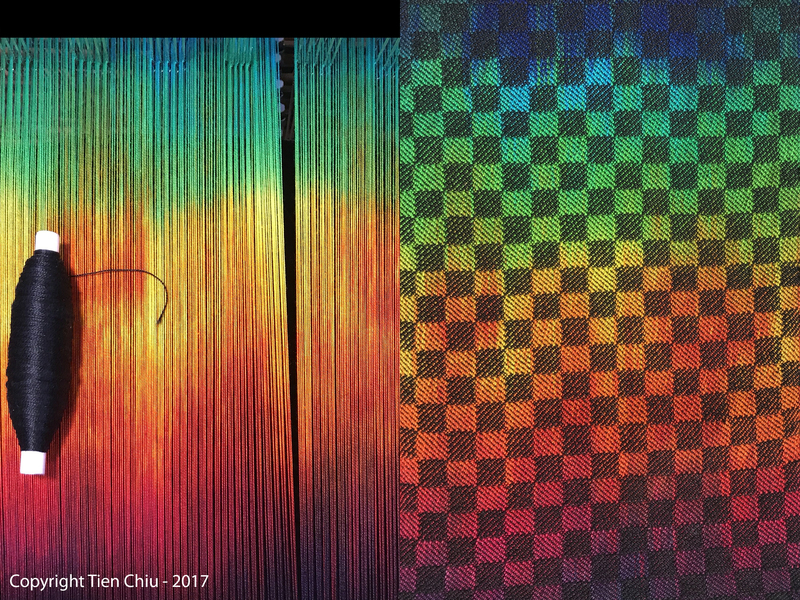 The middle sample shows the warp-dominant side; the right-hand samples shows the weft-dominant side. Handwoven sample showing the effects of gray weft on your painted warp. 3/1 twill. 10/2 cotton warp and weft, sett 30 epi (12 epc). 3/1 twill structure., gray weft. Handwoven sample showing the effects of black weft on your painted warp. 3/1 twill. 10/2 cotton warp and weft, sett 30 epi (12 epc). 3/1 twill structure., black weft. While the colors in the black-weft sample feel more intense, they are also considerably darker and moodier than the colors in the gray-weft sample. The gray weft softens the colors without darkening them, producing a dreamy, watercolor effect. None of these choices is intrinsically better than the others, of course – it all depends on your intent for the cloth. Black intensifies colors but also darkens them; gray softens the colors; and white bleaches them. Which you choose is up to you! Use a denser sett than you would for a balanced weave, producing a warp-dominant fabric on both sides. Choose a much finer weft yarn, which also produces a warp-dominant fabric on both sides. Pick a structure that shows more warp than weft on one side. Design using a weave structure that alternates large chunks of warp-dominant fabric with large chunks of weft-dominant fabric, such as 1/3 vs. 3/1 twill in blocks or stripes. 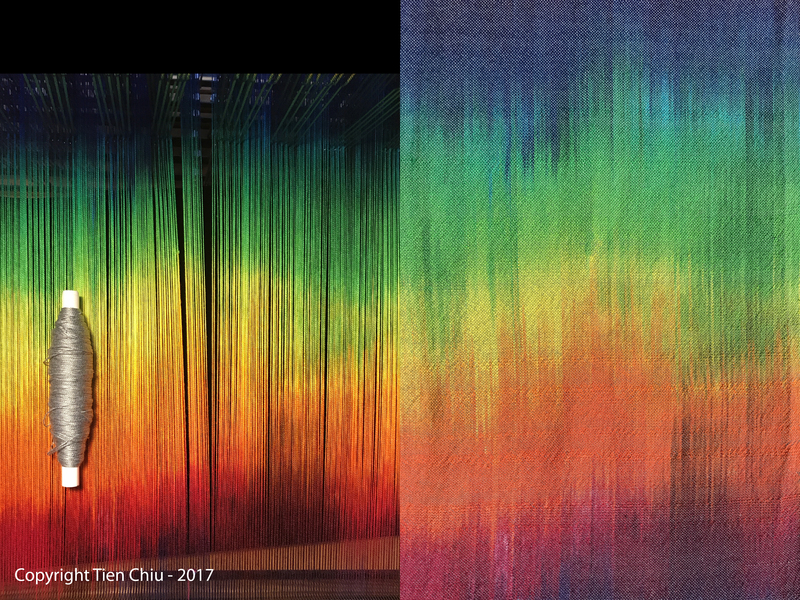 This produces a fabric that shows equal amounts of warp and weight on both sides, but still shows the warp colors clearly. While you can and should experiment with strongly colored wefts, neutral wefts are a safe choice when you want to preserve the hues of your painted warp. Black is often used because it tends to intensify and “bring forward” the colors in your warp. However, black will also darken your colors and make them feel moodier. Gray will soften (and dull) the colors without darkening them as much as black would, and can add the illusion of motion to a piece. And white will tend to dominate and/or bleach your colors. 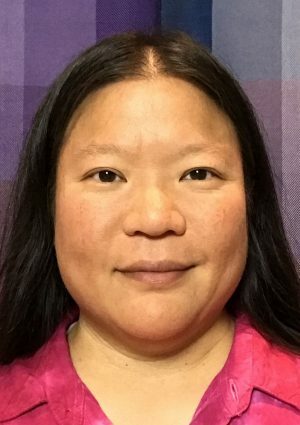 I hope you have found this post useful! If you would like to get notification of new blog posts and upcoming classes, please sign up for my newsletter (and my free e-book!) using the links below. And, of course, please feel free to share on social media, such as Facebook, Twitter, or Pinterest, by clicking on the buttons below this article. Your new format is great…but I miss the cats. LOL! I’m working on a post (on the tienchiu.com blog) about our cat-iversary, which was Friday! Four years with our wonderful cats. This was exactly what I needed! 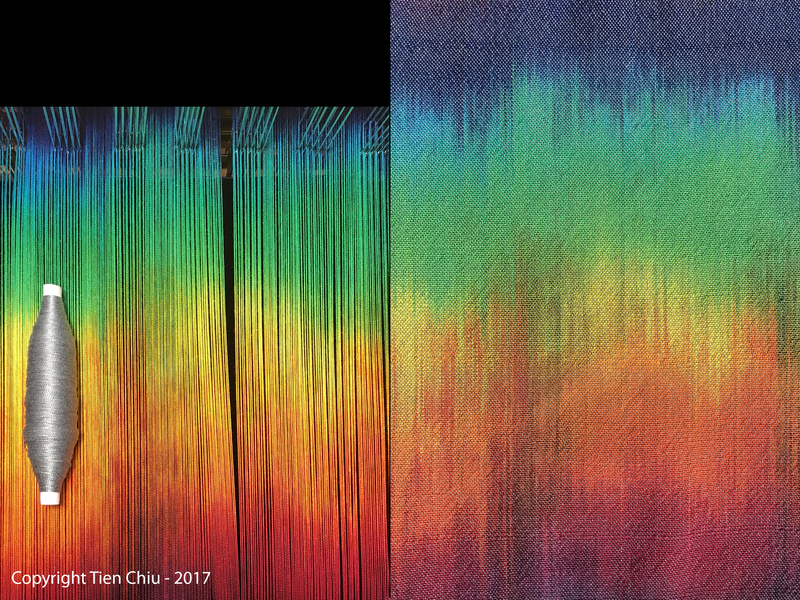 I have two 10/2 warps that I painted this summer, also spectrum based but a bit more pastel than the one you used, and I was contemplating what weft to use. Glad it was helpful for you! A pastel warp will be interesting indeed! Of course, if you choose a gray for blending, pastel warps will “want” a lighter gray. Good luck! Thank you for explaining so clearly the “whys” of color behavior. Muddled colors are my bane and your are helping me achieve what my mind’s eye sees in my cloth. The timing of this post was opportune as well, as I am attending a painted warp class in about two hours and it will help me in the placement and choice of color. One thing to consider when painting warps is what range of light/dark colors you want. Warp that have some very light colors and some very dark colors will tend to show a hide-and-seek effect (like the one that was visible in the gray sample) as they will be lighter than some wefts and darker than others. Warps with lots of light colors or lots of dark colors will tend to respond to a neutral weft more uniformly. Neither is good or bad…it all depends on what you want! These tips are also good for warps in general I would assume. How to showcase warp v. weft. 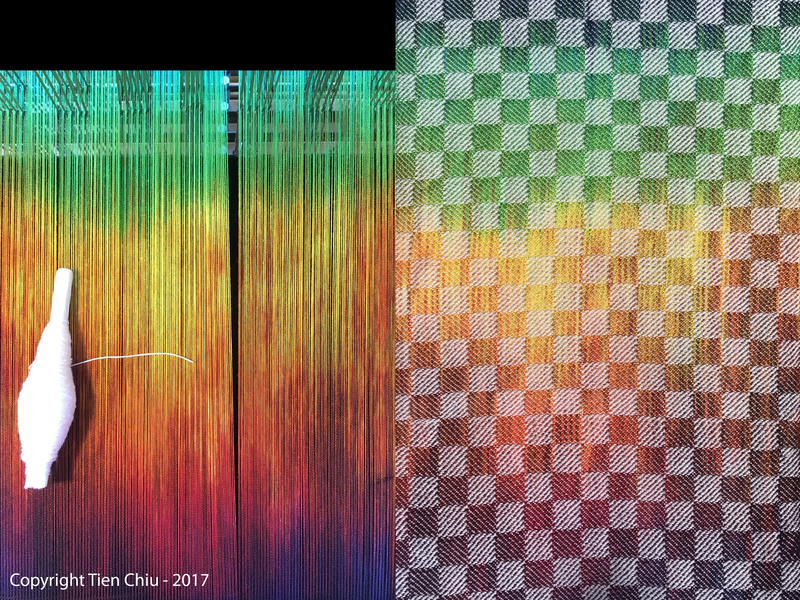 Even tho I’ve never used painted warp, sometimes I wish I were able to have a more predominance in one or the other warp/weft of the fabric. The sett density and size of weft is a good tip on how to accomplish that. Yes, that’s exactly right – the sett density, weft size, and warp-dominant structure methods will all work for any cloth where you want more warp than weft to show. Loved this post! I was just thinking i needed to try out some grey wefts. I am weaving on several painted warps at the moment and have just dyed up two more. I love playing with all the colors! You are putting a lot of work into these and it shows! Thanks for all your hard work and clear examples of what you are talking about. Very enlightening. 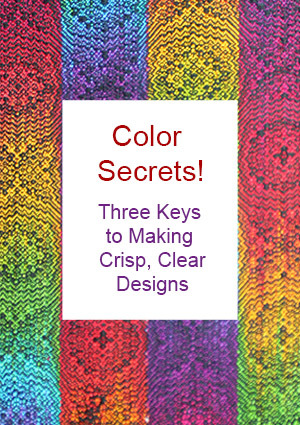 I look forward to using these ideas in my weaving. Thank you! For me, I have found that breaking the painted warp up with some stripes of solid color also seems to enhance the painted part. I have done this with black or gold, and I have dyed some solid warp alongside my painted warp so the colors would work well together. Thank you again for a very stimulating read. That’s a great idea, and can work very well, especially when you want to bring forward or accent a color in the painted warp. Thanks for sharing it! As I am beginning to design woven fabrics with my handspun yarns, always knew that I wanted the warp to show thru. Thanks to your tips in this article, I now know I have to get hold of some commercial black wool and silk blend for the wefts. I for that I love black! So many problems are solved when I read your posts. Thank you for helping us who what to do right by our handspun. It deserves to shine! Your blogs are wonderful, and this is especially timely. It’s cleared up several questions I’ve had about painted warps. I’ll be trying some in the near future! Thank you Tien! This was a very helpful post. Your presentation style is easy to follow and practical. Again many thanks! Where do I get a 3/1 twill pattern (for handpainted yarn), in double weave double wide? I’m having a hard time finding this in my books or on the web. Thanks for this article Tien, it came just in time! Thank you for such an informative and easy to understand article. A lot to ponder and consider. I’m terrible at picking colors and hope to use this information to help me make better choices. I really appreciate the samples, so helpful. Could you discuss how to know if the warp color will be more dominate or the weft color…what type of drafts for each…such as twill, overshot, etc. Sometimes I want the warp to be dominate when I should have made it the weft. Thanks in advance! Complex question! I don’t think I can address it fully in a blog post, but I will definitely make it part of my online class. If I figure out how to boil it down to the point where it fits in a blog post, I’ll definitely write something about it – it’s an excellent question. Thank you very much for asking it – I’m always looking for color topics I can cover/problems I can solve for people! Great post! I’m a total beginner and it was very understandable. The photos demonstrate your ideas beautifully. Thanks for the lesson! Thank you for your great explanation about this. I struggle with color, but fall in love with painted wraps! Hah! Do you think the kind of pattern chosen influences that outcome? I understand the need for warp faced to bring out the warp’s colors, but wonder if there are certain kinds of patterns that are best avoided? Oops! Of course I meant to write painted warps! Definitely! 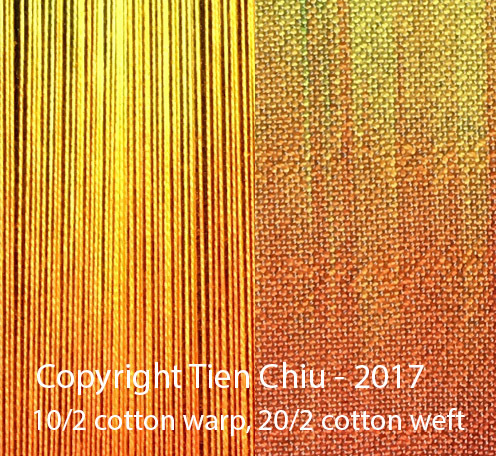 Basically: warp structures that create lots of small dots of warp and weft will blend the warp and weft colors, like mixing paint. So plain weave will mix the colors. With painted warps, this can be a problem because if you have lots of different colors it can be difficult to find a weft that is compatible with all the colors. If you choose a weave structure that creates large chunks of warp dominant areas vs. large chunks of weft dominant areas, then the colors will stay much more “themselves” and the colors of the painted warp will show more clearly.